Get a convenient Front-End Editor that lets you change product information, static blocks or pages on the fly. 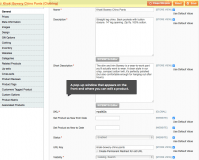 Access a front-end editing mode as admin from the admin panel in Magento. Correct a product price or a typo quickly from front-end in Magento. Easily go back and forth between the front-end and the back-end as admin. Browse the front end of your store while also being logged in as admin. Front-End Editor is an end-to-end solution for advanced Magento content management that you can take advantage of. 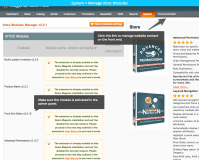 The module provides Magento admins with a powerful toolset that allows for easy management of the content on the site. Since it enables simple adding and editing of product information and quick switching between front-end and back-end, admins get the opportunity to perform the required tasks a lot faster. This results in increased workforce productivity, optimizing your operational costs. Ease of use is one of the main attributes of an efficient content management tool. 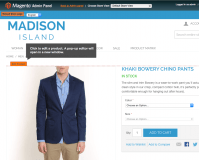 Thanks to the extension, Magento retailers can create attractive product pages and update them timely, making sure the user interface of their stores looks modern and sleek to catch customers’ attention and encourage them to stay. If you plan to expand to new markets, you need to take care, among many other things, of the website localization. To make this challenge a little bit easier, Front-end Editor supports multiple languages, eliminating the need of additional investments into translations. .
Edit product information, static blocks and pages right on the front-end. Browse your store front-end as Admin in Front-End Editor mode. Easily see the content you can edit (editable content is marked with corresponding buttons). Edit the information you need in a convenient pop-up Editor. The same editing options are available front-end and back-end. The extension’s functionality code is 100% Open Source. The extension comes with English, German, Dutch, French, Spanish and Italian locales. 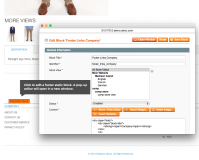 Compatible with Advanced Permissions Magento extension. When you have both Advanced Permissions and Front-End Editor installed, sub-admins can edit only the products or pages they are allowed to edit from the front-end. 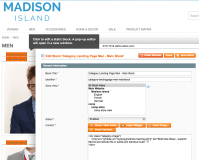 Shopping Cart Editor for Magento - Make your shopping cart more flexible. Magento Reports extension - Track customer statistics and make use of advanced data visualization and detailed reports. Magento Email Notifications for admin module - Ensure higher employee productivity by sending automated emails to your admins. Notify them about new orders or registrations, newsletter subscriptions, discount codes activation, and other events. Magento Delivery Time plugin - Ensure timely delivery with advanced delivery schedule management. Set the time-frames available, choose same-day, next-day or other delivery options, filter orders by delivery date. + The extension now allows to delete / duplicate product from the front-end while in edit mode. * Fixed the 404 page issue for different store views. * Issue with the navigation on front-end when use secure urls in admin is fixed. * Issue with impossibility to create new attribute on edit product page is fixed. * Default Store View option is fixed. * "Reload Store page" button is visible only for admin now. Fantastic convenient! I liked the service! :D They are very helpful and i have bought 6 extensions from them. I have always got great support. Even if it was delayed for the reason of being hectic, they are still trying to help as soon as possible. Thanks Alexander for helping me from your busiest moment.